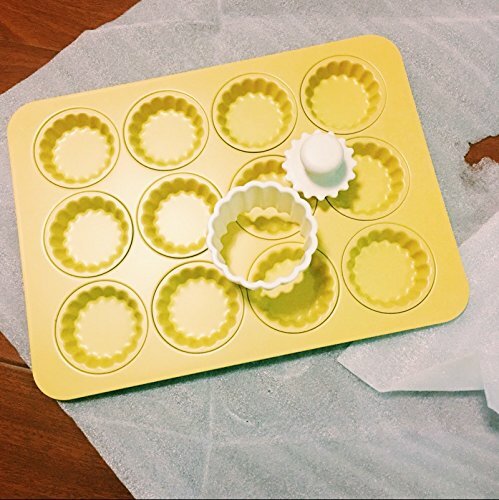 The 12-Well Mini Fluted Tart Pan measures 12.87 x 9.45 x 0.5inches, 2.75"diameter* in each well and is perfect for baking specialty miniature tarts flavors like strawberry cream cheese and peach. Bake flawless crust that comes out of the oven flaky and ready to be filled with your favorite toppings. The pan surface is coated with a patented AMERICOAT Plus coating, a non-stick silicone, allowing you to easily release your baked goods from the pan. Tart Pan commercial grade and heavy gauge- measures : 12.87 x 9.45 x 0.5inches, 2.75"diameter* in each well.Plastic cutter ring measures:3x1.65inch.Stamp measures:1.8"in diameter. Please drying the pan after cleaning.